Natural, minimalist design schemes with lots of wood and metal are in vogue. But what about upbeat and unique? Your home should be a welcoming space for you and your guests, with personal touches reflecting your own interests and personality and if it's low on color, it might be low on personality too. Instead of living in a blank slate, get a little creative and try some of our favorite tips. Whether you're comparing paint swatches or just looking for some colorful décor, your decision will do more than change the look of your home. As you select colors for your window shades, rugs, walls, or anything else, it's a good idea to make sure they have the right effect for the room you have selected them for. Warm colors like red, orange, and yellow are associated with happiness and stimulation, while cool colors like green and blue have soothing, relaxing effects. 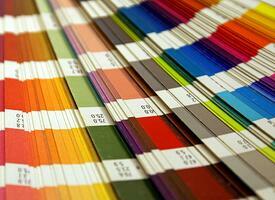 After you've narrowed down your favorite colors and shades, think about the personality you want the room to have. For example, yellow is associated with happiness, but it stimulates energy and hunger, so too much yellow may create restlessness in rooms intended for relaxation. If your favorite space is dominated by wood, metal, or a single neutral color, you don't have to renovate the whole room to harness the mood-boosting effects of color. Instead, take advantage of the opportunity to complement your neutral tones with little pops of color. Accent Pillows – Switch out your sofa pillows (or just the covers) for an assortment of multicolor and solid colored accent pillows. For example, red and purple pillows add a bold, royal feel to a living room with warm-toned wood furniture, while a mix of blue and green add a relaxing, beachy feel to a crisp white couch. Table Settings – Table runners, place mats, dishes, silverware, and even napkins are great opportunities to add color to a dining area or open kitchen. If your table and chairs are neutral, there's no reason to stick to boring white china and napkins. Get creative by mixing and matching different solid colors, or look for bold patterns that complement your furniture and fixtures. Window Shades – Sometimes, the best way to brighten a home is to add some shade. Whether you're blocking glare and heat on your patio or upgrading your indoor spaces with blackout fabrics, consider fabrics that aren't beige or white. Polar Shades carries fabric available in mulberry, pesto, burgundy, Bermuda, and more. When you want to add cheer to your home with colorful window shades contact Polar Shades at 702-260-6110. Leading the window shade industry in quality window shades and providing a free in-home consultation, Polar Shades is the easy choice.